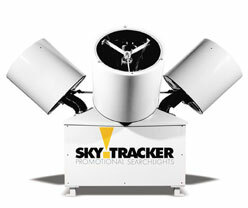 SkyTracker Promotional Searchlights have become the world�s best selling promotional searchlight. The unique bent shaft technology creates a "clover leaf" pattern of light that demands attention as it sweeps across the night sky. 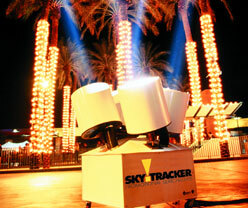 SkyTrackers create that �Hollywood� excitement that make any event a special event. 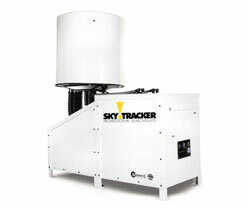 �Whether you rent or install, you can't beat the return on advertising dollars"
Single head and four head SkyTracker Searchlights are available for permanent installation or for short term events. All units are available for sale or rental.